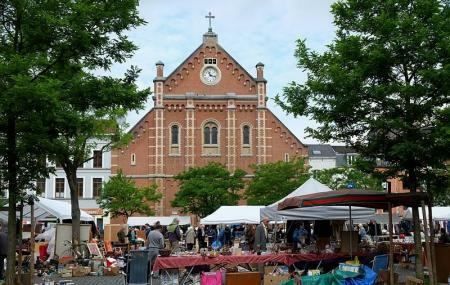 The thrice weekly market at this square is a worthy addition to Brussels’ market scene. It's said this place has the best waffles in the city - the perfect harmony of crunchy, sweet and hot - served by Jean Gaston. While there is a lot of other food too, some vendors can be seen clothes, jewellery and flowers. Tuesdays are a bit slow. The best market day is Saturday. There is a shopping mall and an art house cinema near the square. Market Hours: 8:00am - 1:00pm on Tuesdays, Fridays and Saturdays. How popular is Stockel Square? People normally club together Park Laeken and Cinquantenaire while planning their visit to Stockel Square. People also prefer to start their day with Stockel Square. Practical renovation of square with te addition of a new café selling excellent Flat Whites and Long Blacks and excellent cheery service. What can one say??? The resurfacing has been nicely done though wasting a lot of precious space in an already crowded urban environment. The overall new concept is nice but ... as a very usual Belgian signature the coexistence of pedestrian, two-wheeled and four-wheeled is a total failure. It does feel like there is either a lack of competence or a lack of will to create a fluid traffic environment. The shopping center is small but it is modern, clean and has some interesting stores! The shopping has a metro station, a bus station and also, a tram station. It has a supermarket, a bakery and lots of parking, above ground or underground! A village with full of history and information. Markets restaurants pet shops and Metro 🚇 are available.